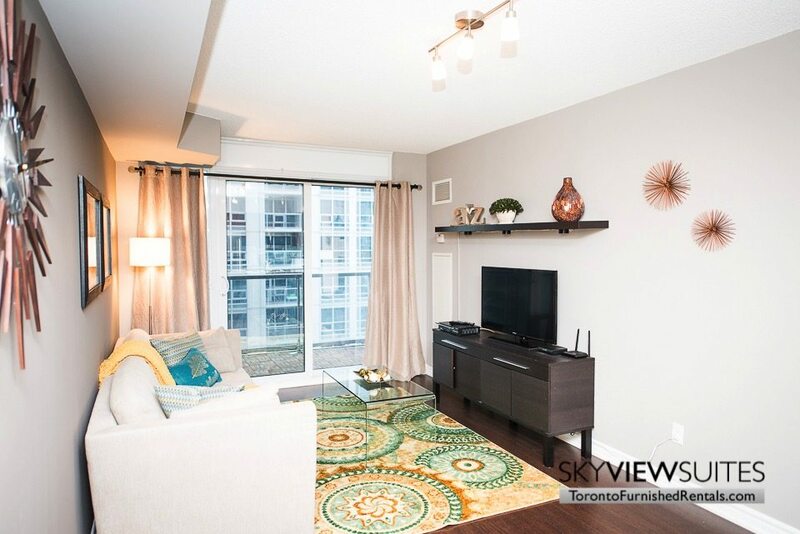 This spacious Toronto furnished apartment is the perfect home away from home during your extended stay. 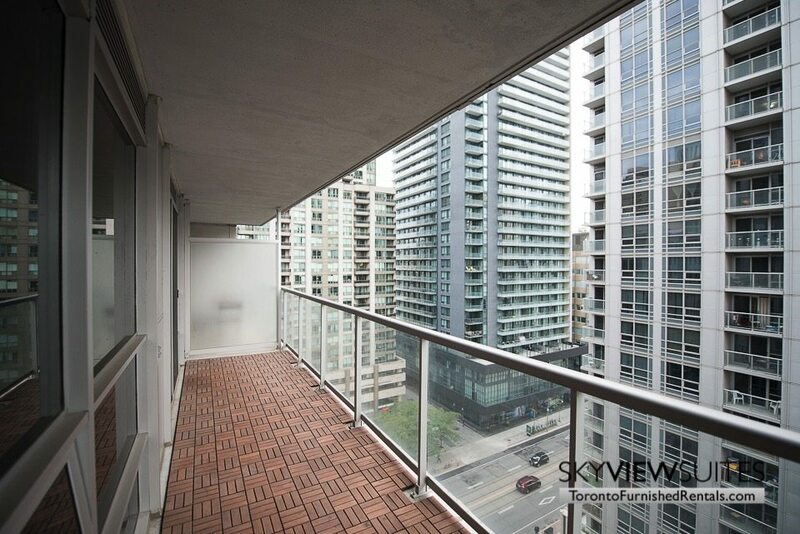 Fully furnished and located in Toronto’s Bay st. corridor it is sure to impress any corporate traveller. Walk down the foyer of this apartment into the bright and inviting living space. A plush cream couch with bright accent pillows is the perfect place to relax after a long day at work or exploring the city. Curl up in front of the flat screen TV and enjoy unlimited access to Rogers VIP cable or watch a movie with the DVD player provided for guest use. This living space also permits access to a large private balcony ideal for enjoying a cup of coffee on a warm summer morning. Adjacent to the living space is the beautiful fully stocked kitchen. This space features a stylish cream coloured granite counter top, striking dark grain wood cabinets and a functional breakfast bar. The back splash of the kitchen consists of easy to clean mirrors that also make the space feel even larger and more open than it already is. 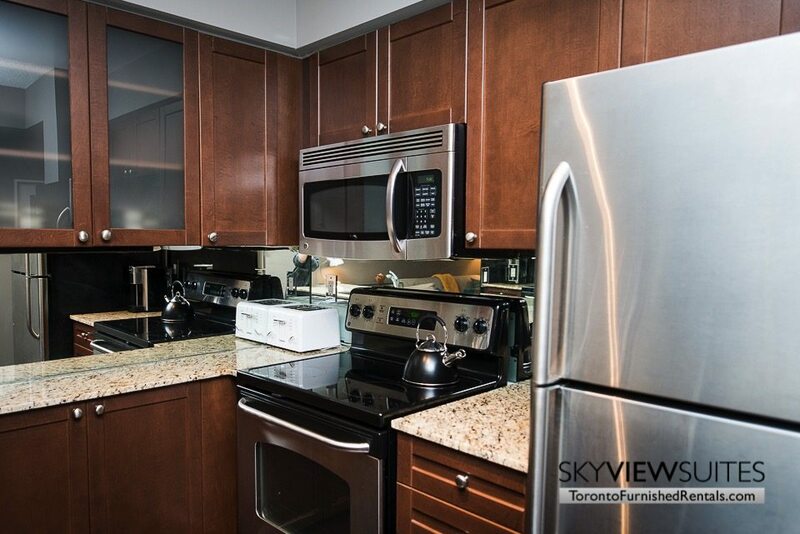 Guests will be pleased to know that this kitchen also comes with full sized stainless steel appliances. All cooking utensils, pots, pans and cutlery come provided as well. Just down the hall from the main living space is the master bedroom. 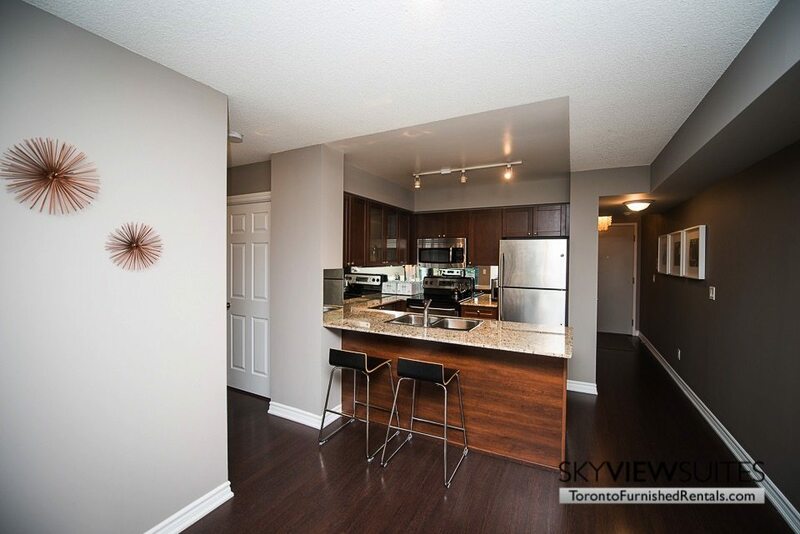 This master offers a spacious room not commonly found in 1-bedroom Toronto furnished condos. It is an inviting space that features a large king size bed complete with soft linens and a plush grey headboard. Guests will pleased to know that this room also comes with it’s own wall mounted flat screen TV so guests and enjoy endless films and shows from the comfort of their bed. A large closet provides plenty of storage for guests during their stay and is also where extra sheets for the bed can be found. Last but not least, is the stylish bathroom that is located just across from the bedroom. Here guests will find a bathtub- shower combination, and vanity sink with plenty of storage underneath. Bath, hand and face towels also come provided with this unit. 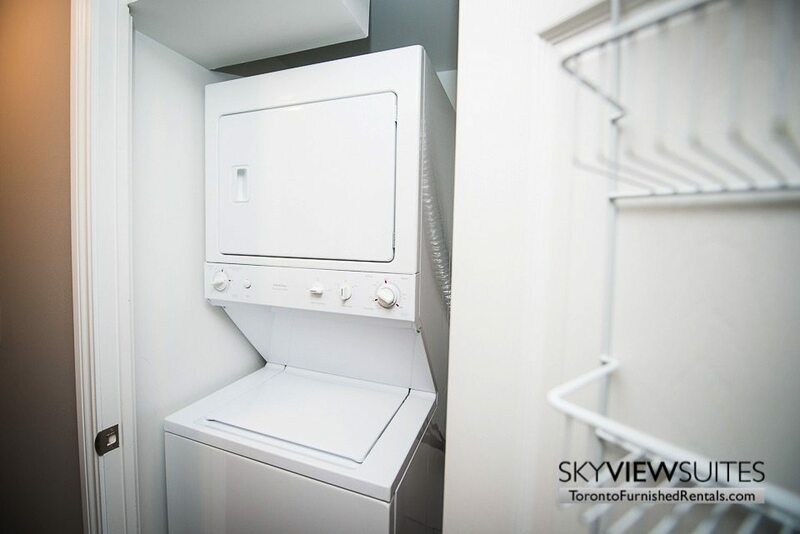 Laundry is also conveniently located ensuite and tucked away in a closet. 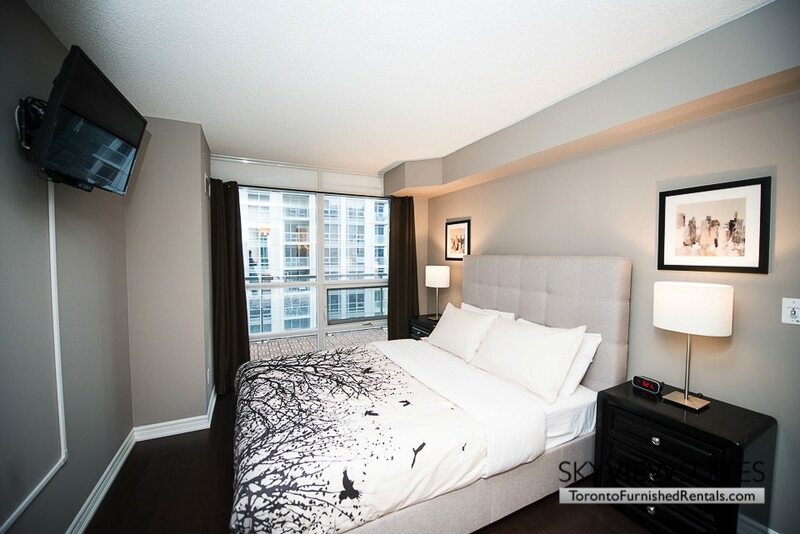 Located on Toronto’s Bay St. Toronto furnished living guests have direct access to theatres, restaurants, shopping and essentials such as grocery and drug stores. This area also permits easy access to Toronto’s financial, entertainment and hospital districts as well as the University of Toronto and Ryerson University. 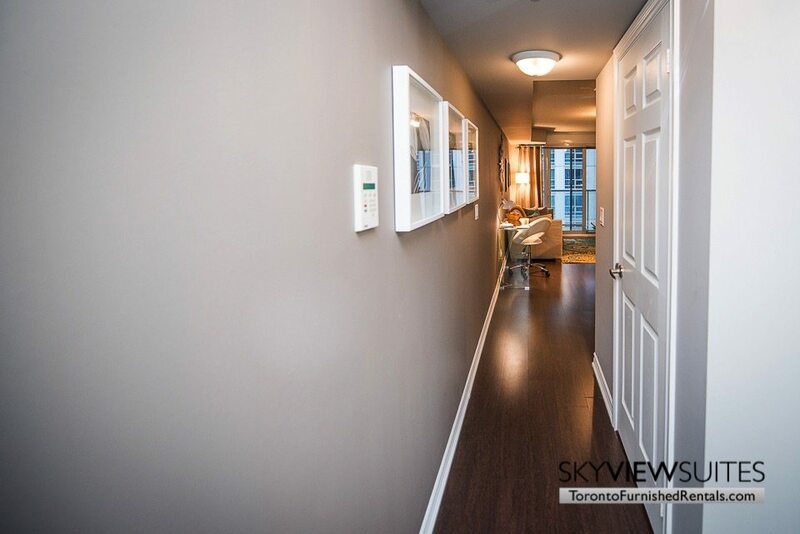 For those looking to commute to other areas in Toronto for work or play will be pleased to know that this unit is located conveniently between two subway stations that will take you all over the city. We know people looking for furnished apartment for rent in Toronto are probably looking for a fully stocked kitchen, but there are also some great restaurants in the area to check out. Guests who are fans of Italian food should check out Tosto Quickfire Pizza and Pasta. This trendy spot offers its guests premium handcrafted pizza and pastas that is fresh and quick to order. 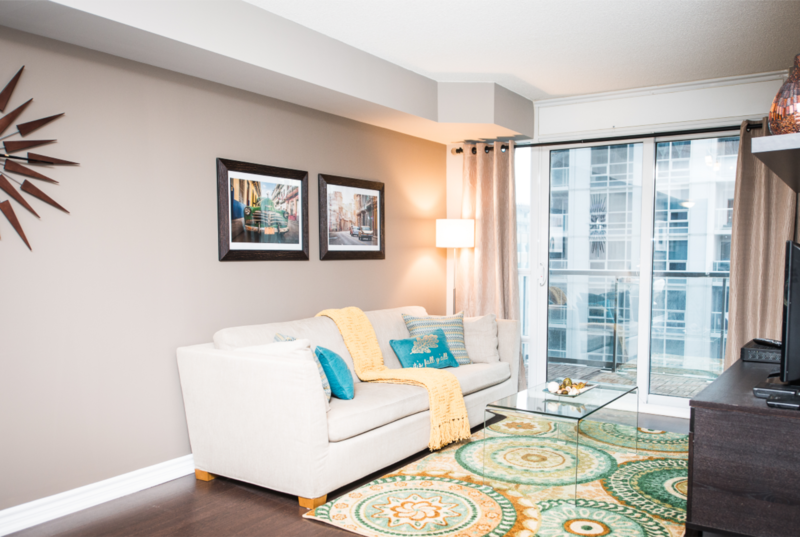 We want guests of our Toronto furnished Suites to have the best stay possible, which is why we offer the best amenities in the best buildings. 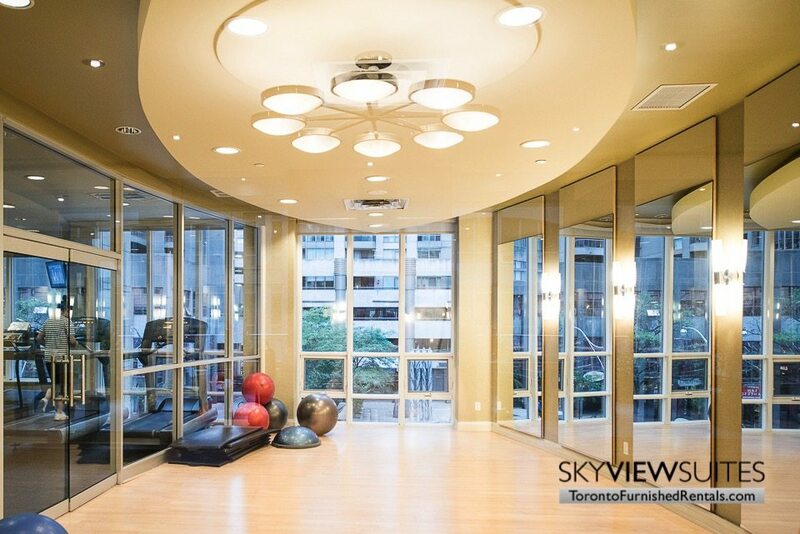 This suite is located in a beautiful 46 story, modern building in the heart of Toronto that has a wide range amenities accessible by Sky View Suites guests. 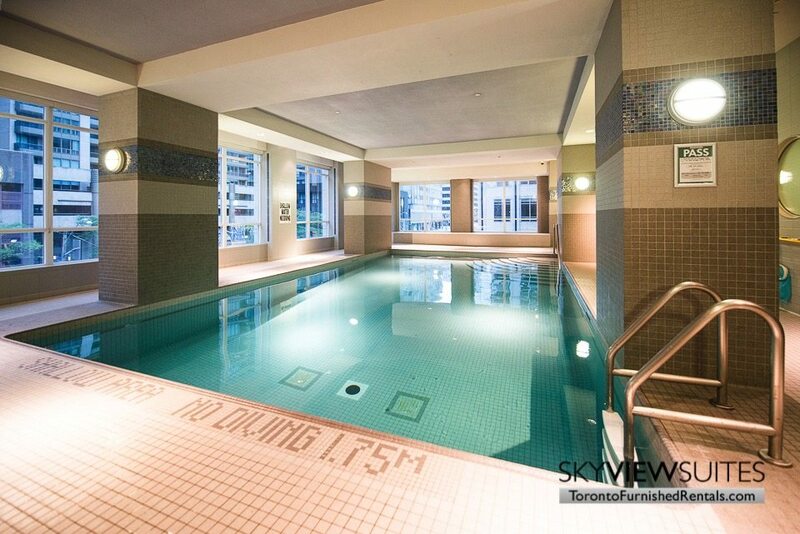 Amenities include, an indoor pool, fitness facility, sauna and whirlpool. Guests will be pleased to know there is also a 24hr security desk and concierge service located on the main level. Of course all of Sky View Suites also come with unlimited Wi-Fi, local calling and VIP cable service.